Published in Rafu Shimpo, November 21, 1970, Japanese section. 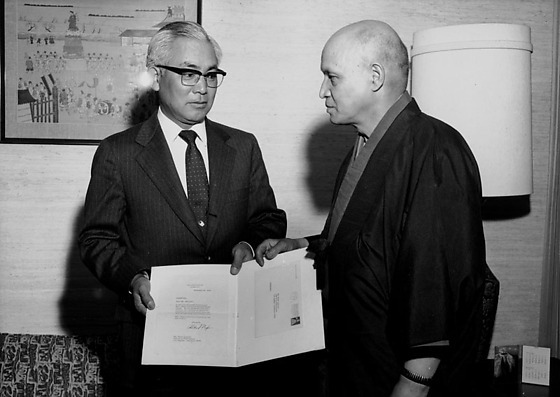 Consul General of Japan Kanji Takasugi presents a thank you letter from President Richard Nixon to Shoun Igarashi for his Byobu screen at the Consul General's office in Los Angeles, California, November 20, 1970. Dressed in eyeglasses and suit, white-haired Takasugi, left, and balding Igarashi in kimono, who stands in profile, hold letter and envelope mounted on a folder; couch, lamp, and framed Japanese artwork in background. Typed on original envelope: Mr. Takasugi & Mr. Igarashi -- at Con Gen Off. Shoun Igarashi was a Japanese style painter who presented Presented Nixon with a painting, Morning sun and crane, via the Embassy. Nixon sent a thank you letter in response.